Dixit is more about enjoying company than about winning, so a strategy guide to Dixit is somewhat inappropriate. But it is fun to see how, even in a mellow game like Dixit, strategy can still can play a role. So here’s a tactic to guess correctly more often in Dixit. The tactic has everything to do with paying attention to the cards a player played in the previous rounds. I start off with a simple example. You are playing a game of Dixit with Anne, Bob and some others. It is Anne’s turn and she describes her card as ‘someone that lives beyond his means’. 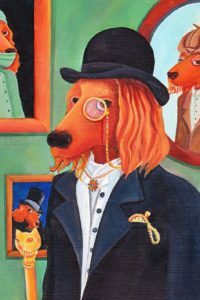 Everyone plays a card, and one of the cards is a dog wearing an expensive suit. The dog’s clothes are, especially for a dog, pretty nice, so this must be the card Anne just played. So far so good, this card looks like it fits Anne’s description perfectly and it seems like a good idea to point to that card as Anne’s card. But there’s a twist. The previous round it was Bob’s turn, who described his card as ‘a wolf in sheep’s clothing’. 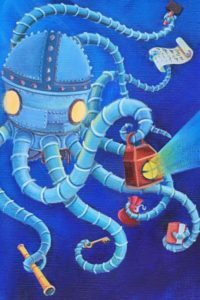 That round Anne played a robot-octopus card. Had Anne played the dog in the nice suit that round it would probably have earned Anne some points. With this in mind, it seems obvious to think that the dog in the suit is not Anne’s card, but someone else’s. Anne would be glad to have played this card previous round instead of the robot-octopus. Off course, it is possible that Anne just got the card after Bob’s turn. But because this is only one round ago, she has had only one chance to get this card, which is somewhat unlikely. By paying attention to the card Anne played last round, we can thus better guess which card she played this round. And we can use this technique more broadly. We can consider not only a player’s last round, the last couple of rounds, or even all rounds. If we notice that a player plays weak cards at descriptions about birds, it is likely he doesn’t have cards with birds in his hand. Or when a player played a worthless card at a Lord of the Rings reference, it is not likely he has a good Lord of the Rings card in his hand later in the game. The more rounds ago a player played a bad card, the less this information is worth, because the player may have a lot of new cards now. Still, it is important to note that in Dixit the information about former rounds is never completely useless, because it is possible that a player holds on to a big part of his hand and only plays the new cards he gets. In such cases the information you have about his hand remains true. If you want to play like a professional, you can off course watch the positions of the cards in the hand of your opponent to observe whether he plays his new cards. But this is a bit too much for a nice and friendly game of Dixit, in my opinion.